For a starch and vegetable side dish to complement pork chops, toss 12 ounces of trimmed green beans, 4 diced medium Yukon gold potatoes, and 2 to 3 jarred, coarsely chopped roasted bell peppers with 3 tablespoons of olive oil. Arrange in a single layer on a cookie sheet and season. Preheat oven to 475 degrees Fahrenheit. Roast the vegetables until crisp and tender, about 25 minutes. Pickles or any sweet and sour slaw go well with seared or fried pork chops. 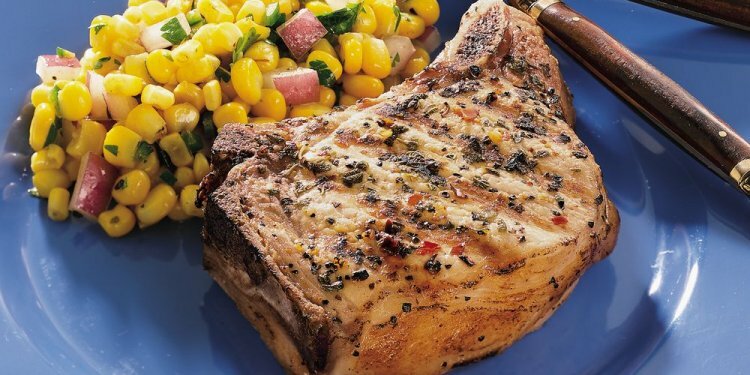 Fruits are also side dishes that are compatible with pork chops. Stir fry apples, firm plums or nectarines, or core and halve plums or nectarines, brush them with olive oil and brown them on both sides in a grill pan, about two minutes per side. For a salad the next day, combine pork chop meat and diced apple with baby greens. When in doubt, there's pork and beans. These two go together in any form, including herb-infused cannellini, Tuscan white, navy or any mild, white variety of beans. Beans tend to act as a neutral, but delicious, counterpoint to seasoned pork chops.